All of the victims who died were senior adults who attended First Baptist Church of New Braunfels. 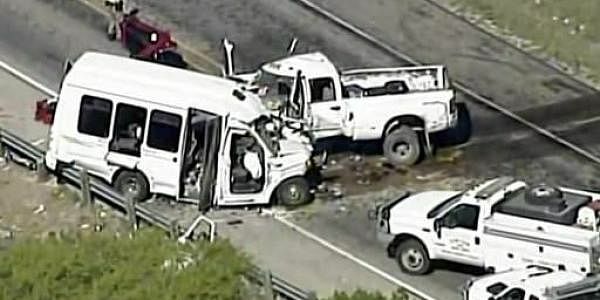 UVALDE: A small shuttle bus carrying Texas church members home from a retreat collided head-on with a pickup truck, killing 13 people and injuring two others Wednesday on a two-lane highway in southwestern Texas, officials said. All of the victims who died were senior adults who attended First Baptist Church of New Braunfels, Texas, including the driver. A total of 14 senior adults were on the bus and the driver was the only person in the pickup when the vehicles collided about 12:30 p.m. on U.S. 83 outside Garner State Park in northern Uvalde County, according to Texas Department of Public Safety Sgt. Conrad Hein and a church statement. The area is about 75 miles (120.7 km) west of San Antonio. Hein said two other bus passengers and the pickup driver were injured and hospitalized. One of those passengers died at a San Antonio hospital late Wednesday, DPS Lt. Johnny Hernandez said. The lone surviving passenger was hospitalized in critical condition, while the truck driver was hospitalized in stable condition, he said. It was not immediately clear what caused the collision about 120 miles (193.1 km) from the church, where the members were headed. The National Transportation Safety Board has sent investigators to the scene, NTSB spokesman Terry Williams said. Photos and video of the crash's aftermath showed heavy damage to the front drivers' sides of both vehicles where it appeared the two had collided. The back of the bus was up on a guardrail, with glass and debris scattered onto the grass below. Hein said the small bus was a 2004 Turtle Top, though he did not know the specific model. Turtle Top's website features shuttle buses with capacities ranging from 17 to 51 passengers, which they bill as "a great alternative to the standard 15-passenger van." Safety concerns have long surrounded the 15-passenger vans, also frequently used by churches and other groups, with advocates saying they can be difficult to control in an emergency. Church officials said in a statement on the First Baptist website that the members were returning from a three-day retreat at the Alto Frio Baptist Encampment in Leakey, about 9 miles (14.5 km) north of where the crash happened. The church officials were "ministering to family members to help them deal with this tragedy," according to the statement. Counselors also were scheduled to be available Thursday at the church. Texas Gov. Greg Abbott and his wife, Cecilia, offered their condolences in the hours after the crash. "We are saddened by the loss of life and our hearts go out to all those affected," their statement said. "We thank the first responders working on the scene in the wake of this unimaginable tragedy, and ask that all Texans join us in offering their thoughts and prayers."